Wow, I just spent a couple of days in Music Heaven…for me! I went to a Music for People workshop in Stonypoint, NY that blew me away! I have been doing improvisational music pretty much ALL of my life, but Never have I been in the room with 50 or more people improvising TOGETHER! Yeah, I’ve been to drum circles where you can get a really great groove with different instruments that show up, but this group included orchestral, band, world music instruments and more! Wow! We “played” together all weekend! It was Very intense, but the most fulfilling experience I’ve had in a very long time!!!! I also had a healing while there; no surprise with the super new moon and other alignments coming in. When I was young, probably 3rd/4th grade my mother forced me, and my siblings, to take piano lessons. I remember it being a grueling experience that didn’t end well and, fortunately I at least learned to read the treble clef for singing. I rarely have touched a piano or keyboard since, except to pound out some notes to rehearse for a performance. 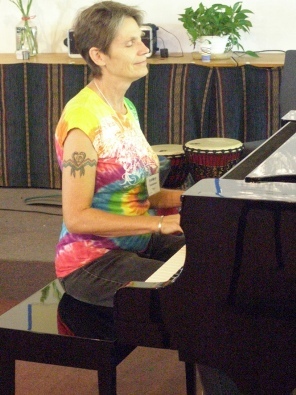 While at the workshop I was looking into the extended 4 year certified Facilitator training and it required the student be able to sing and play drum, an instrument of their choice AND the Piano! I started getting anxious at the thought of having to learn again how to play, until I spoke with my roommate who is in the program. She said you have to be able to “play” the piano improvisationally, with feeling and ease. Hmmmm. Ok. So, I slept on that thought, which felt open and soft and inviting. In the morning I had the sense that the “little girl” in me wanted to play, so I headed to the great room where the grand piano was, but someone was in there. As I was leaving, feeling a bit disappointed, I noticed one of the side rooms open and it had an upright in it, a bit like the one I grew up with. Hmmmmm. Well, I closed the door and sat at the keyboard and breathed. As I laid my hands on the keyboard, I felt very light, so I let my hands come down where they were, with the pedal down that lets the note ring, and just let it fill the room. I did that a few more times and found my fingers dancing all over the place in a playful way WITH MY EYES CLOSED! WOW! I can’t describe the wellspring of joy that poured out of me through my heart and my eyes and my voice as I sang along! I then went to another part of the workshop and the instructor was there to share a segment on how to “play” the piano…and I volunteered and one of the other students played a flute with me and it was amazing! You Never know when a healing will sneak up on you and take you to new heights….In Joy the Journey!